Peter is Professor at the School of Psychology at the University of Newcastle providing academic leadership in Neuroscience. 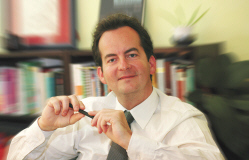 Peter developed his interests and techniques at the Clinic for Neurology (Prof. Wilfried Lang and Prof. Lueder Deecke) and the Ear-Nose-Throat Clinic (Prof. Ehrenberger) at the General Hospital in Vienna as well as at the St. Andrews University in Scotland (Michael D. Rugg). Peter has published extensively in neuroscience including prestigious journals such as Nature. Peter is an internationally recognised expert in Human Brain Research. Peter's Neuroconsulting experience goes back to 1999 when he conducted the first study for a retail branding company in Austria. Since then, Peter has had extensive experience in working with a number of commercial clients. Newcastle Innovation is the commercial arm of the University of Newcastle. Newcastle Innovation is a not-for-profit organisation with the mission to facilitate the transfer of knowledge, technology and scientific research from the University of Newcastle to its commercial partners, thus creating economic value. Newcastle Innovation will work with clients to ensure that necessary contracts are put in place and that project deliverables and outcomes are effectively managed. On the world stage, the University of Newcastle delivers groundbreaking research in health and medicine, science and engineering, and energy and the environment. In recent years, we have doubled our research income and we consistently rank in the top 10 universities for research in Australia. Built on the principles of equity, excellence and engagement, the University of Newcastle has a strong record for connecting with partners and communities across the world and across our region. Our commitment is to build a world class institution with global reach that makes a difference to the region we live in.